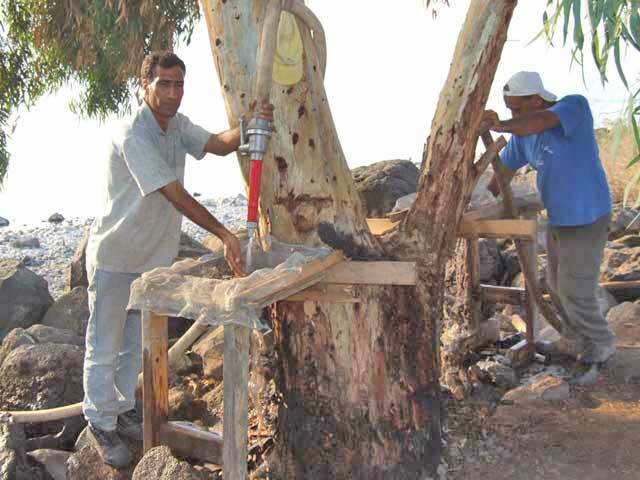 During May 2007, a test probe, followed by a salvage excavation during May–July, 2008, were conducted at a small Natufian site, Hof Shahaf, located above the southwestern bank of the Sea of Galilee (Permit No. A-5401; map ref. NIG 253459–488/738833–898; OIG 203459–488/238833–898). 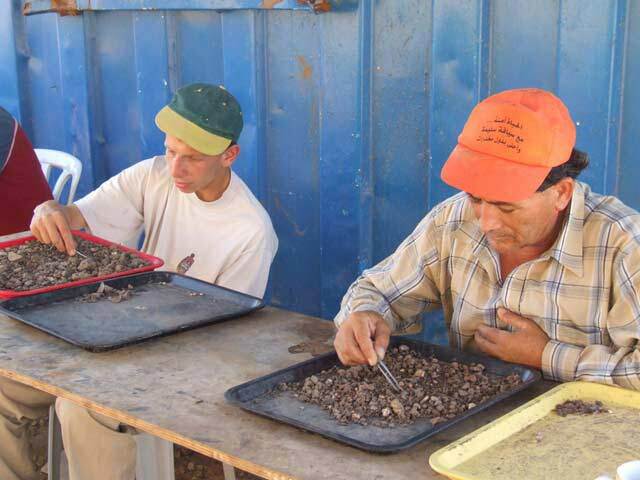 The excavation, undertaken on behalf of the Israel Antiquities Authority and funded by Meqorot National Water Company, was directed by O. Marder, H. Smithline (photography) and R. Yeshurun, with the assistance of G. Jaffe (area supervision), R. Meshayev, T. Meltsen, V. Essman and M. Kipnis (surveying and drafring), A. Shapiro (GPS), O. Ackerman (geomorphology), I. Hershkovitz (physical anthropology) and E. Weiss (archaeobotany). The excavations were part of the initial stage of a major project intended to widen the salt-water channel that runs along the west bank of the Sea of Galilee. The site, 200 m below sea level, is situated on a narrow shelf that extends eastward above a steep slope (Fig. 1). It was discovered during a systematic survey (Permit No. A-4494), in which a small number of flint artifacts in a limited area on the slope and adjacent to the western side of the water channel were recorded. The site had suffered from destructive disturbances, such as the construction of a water-carrying channel that bisected the site, a road along the shoreline that had severely cut into the steep slope and intensive geological and geomorphological events, which resulted in colluvial accumulations of basalt boulders and lime stones above and below the site terrace, as well as deep in the excavation matrices. The excavations were aimed at better defining the magnitude and the chronology of the site. 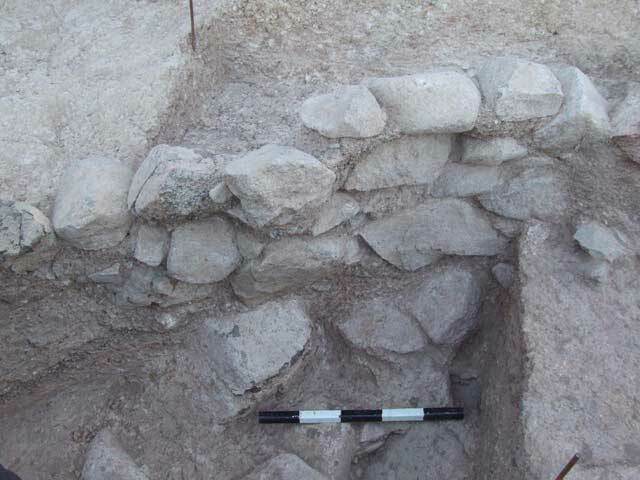 The test probe revealed a segment of a rounded wall, as well as flint artifacts dating to the Natufian period and the Pre-Pottery Neolithic A. The salvage excavation (78 sq m) was carried out to the west and east of the channel. The excavation on the western side exposed the remainder of the oval structure that dated to the Natufian period (15,500–11,000 cal. BP). The structure was set into the marl and silt sediment of the Kinneret paleolake. Near the structure and to its northwest were human skeletal remains. The excavation area had a square grid of 1 × 1 m (Fig.2). The excavation on the eastern side of the channel exposed the eroded and extremely damaged slope that contained rich Natufian finds, although not necessarily in primary deposition. The basic excavation units were 2 × 2 m squares that were divided into 1 × 1 m squares, depending on the archaeological relevance of the matrix. All excavated material was dry sieved. Upon reaching archaeological matrices, all the material underwent wet sieving (Fig. 3). Thereafter, the material was sun-dried and then carefully picked and sorted (Fig. 4). Overall, about one third of the excavated soil underwent wet sieving. 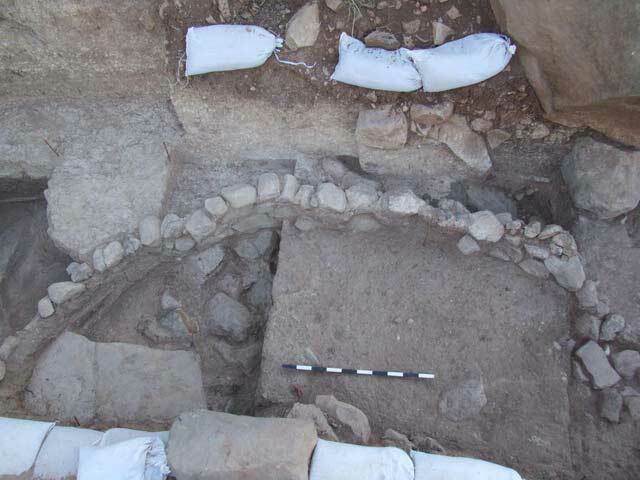 Four main geological units (1–4) were discerned within the excavation area. Unit 1 comprised basal vesicular basalt, possibly the remnant of an ancient flow. Unit 2, limited to the southwestern section of the excavation, was the Kinneret formation, composed of crossbedded layers of marl, coarse sand, and limestone and basalt pebbles and boulders. These layers represented several depositional environments that reflected the dynamic changes of the Kinneret palaeolake over the course of thousands of years. Unit 3 (Fig. 5) was a thin coating of travertine that appeared in limited areas of the northeastern quarter of the excavation. The travertine coated and abutted portions of the Unit 1 boulders. Embedded in the upper surface of the travertine were flint artifacts, bones, freshwater shells (mainly Melanopsis), a freshwater crab claw and possibly root and bark imprints. The localized travertine crust indicated the existence of a prehistoric fresh-water spring, which appears to have attracted human occupation. Unit 4 was the main anthropogenic and depositional archaeological accumulation. It comprised paleosols that contained chalk concretions, angular small limestone and worn basalt cobbles. The oval structure (diam. 4.75 m; Fig. 6) was built of unworked fieldstones. Construction of the channel destroyed the eastern portion of the structure .Its wall was preserved to a maximum of four courses high (c. 0.7 m; Fig. 7). No entrance was discerned. Several living surfaces (combined depth c. 0.45 m) that consisted of compacted brownish gray fine palaeosol were identified. In comparison to the artifact density outside the structure, the density within was rather low. The finds consisted of flint artifacts, Dentalium, bones and sporadic patches of charcoal. 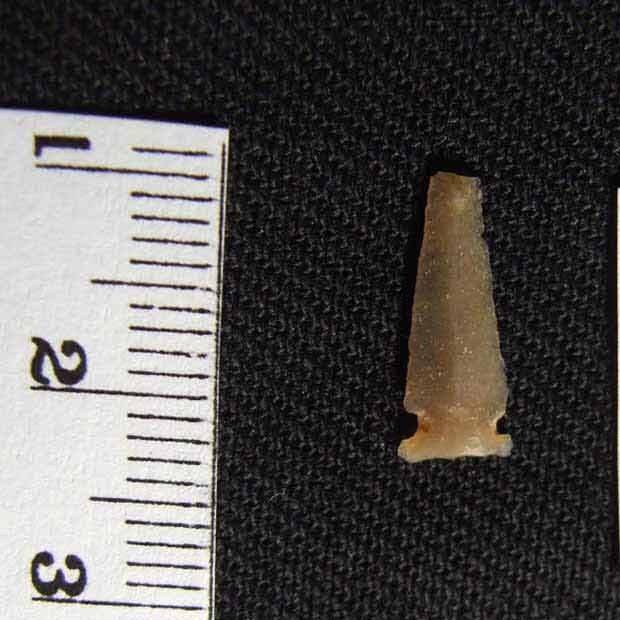 The flint artifacts included small lunates modified by Helwan retouch (Fig. 8) and sickle blades dating to the Natufian period; the bones represent gazelles, small mammals, turtles, birds and a few fish. An open area, adjacent to the north of the structure, contained the majority of ground-stone artifact fragments (pestles, mill stones and pounders). 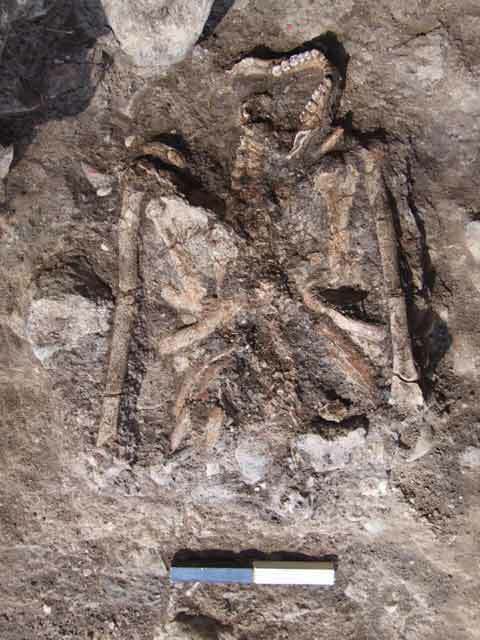 A human burial was uncovered on a stone surface, 1.5 m to the northwest of the structure (Fig. 9). Only the upper half of the skeleton was preserved. The skull was likewise missing but the lower jaw was found in situ, facing north. The interred was lying unusually on his chest (Figs. 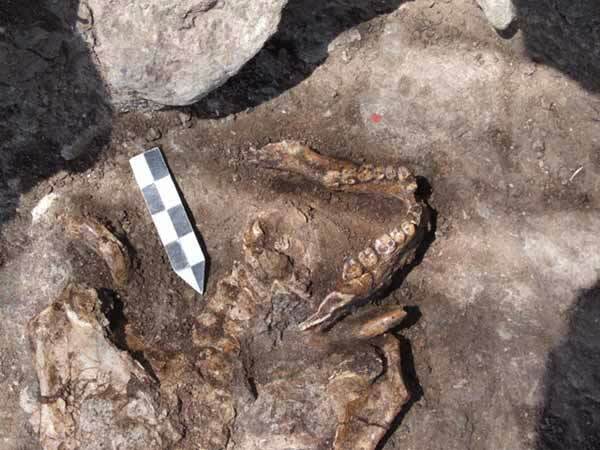 10, 11) and a single fluted Dentalium was found on his torso. South of the structure, only evidence of the Kinneret formation and its sedimentation were identified and no human-related artifacts were retrieved. 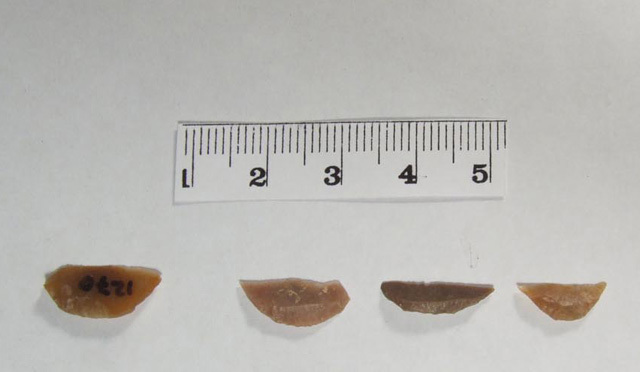 In addition to the clear Natufian presence, flint artifacts, e.g., el-Khiam points and awls on bladelets with miniature points, dating to the PPNA (11,000–9,500 cal. 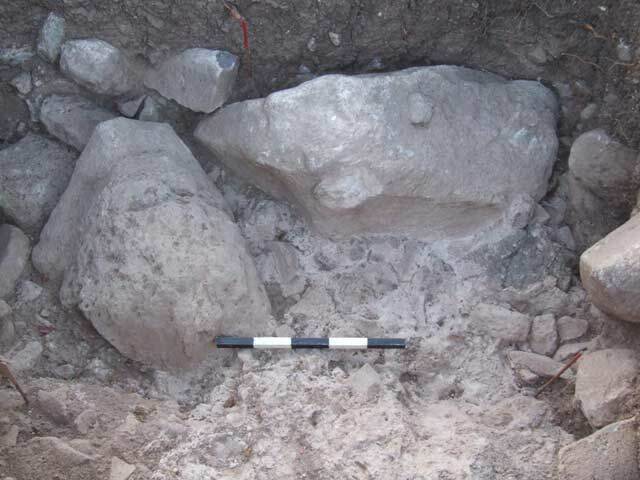 BP) were retrieved from the palaeosol (Fig. 12). Their presence suggests a possible PPNA occupation in close proximity to the Natufian finds. The eastern excavation area was a narrow strip between the water channel and the descending slope (length c. 25 m), two meters lower in absolute height than the western area. The stratigraphy of this area differed somewhat from that of the western one. Three layers were discerned and the most significant one was the lowest, which consisted of a light brownish gray paleosol rich in Natufian archaeological material with a few later intrusions. No architectural remains or a clearly defined living surface were revealed in this area and it is not as yet clear whether the Natufian finds were in primary deposition. The excavations at Hof Shahaf revealed a site of great importance in terms of archaeology, geology and geomorphology. Although indications of a PPNA presence at the site occur, the major occupational phase is dated to the Natufian period. A relatively well-preserved oval structure with a series of living surfaces, which is dated to the Natufian period on the basis of the flint artifacts it contained, was uncovered. Adjacent to the structure was a human burial, accompanied by a fluted Dentalium shell. The preliminary examination indicates that most of the recovered diagnostic tools are the Helwan retouched lunates, which point to the early Natufian period, although their size may imply a later date. Only future systematic lithic analysis accompanied by absolute dating will assist in determining a more exact chronological attribution. The discovery of a presumed fresh-water spring within the bounds of the excavation suggests that the Natufian settlers were attracted to this source of potable water for their subsistence. This is supported by research studies of the Kinneret palaeolake, which show that at 15,000 BP the Kinneret was probably several meters lower, at c. –215 bsl, as opposed to today's level of –212 bsl, and in consequence, it was both further from the present shoreline and more saline. The size of the site is indeterminable due to the natural and anthropogenic destructive activities that it sustained. The relatively sparse artifact density within the structure raises a number of interpretive possibilities: Does this reflect a short-term occupation? Is this a result of site-formation processes where the occupation sits on a steep slope and its remains are gradually washed down the eastern slope? Is this a result of continuous cleaning of the internal living surfaces that eventually resulted in low artifact densities? 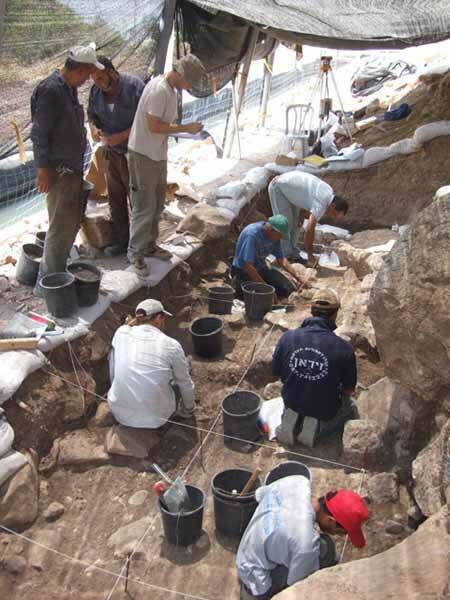 The results of the excavation contribute new data concerning subsistence strategies and settlement patterns of hunter/gatherer groups during the Later Pleistocene and the onset of the Holocene (Epipaleolithic and Pre-pottery Neolithic periods) in tracts bordering the Kinneret. It is particularly important due to the nearly complete absence of Natufian sites in this region. 1. Excavation area, prior to fieldwork, looking north. 2. Western area, excavation method of 1 sq m grid. 3. Wet sieving, using a high pressure water hose. 4. Picking and sorting dried material after wet sieving. 5. Eastern area, travertine remains of presumed fresh water spring. 6. The oval structure, looking west. 7. The oval structure wall, with Unit 2 boulders below, looking southwest. 9. The oval structure and adjacent burial, looking south. 10. 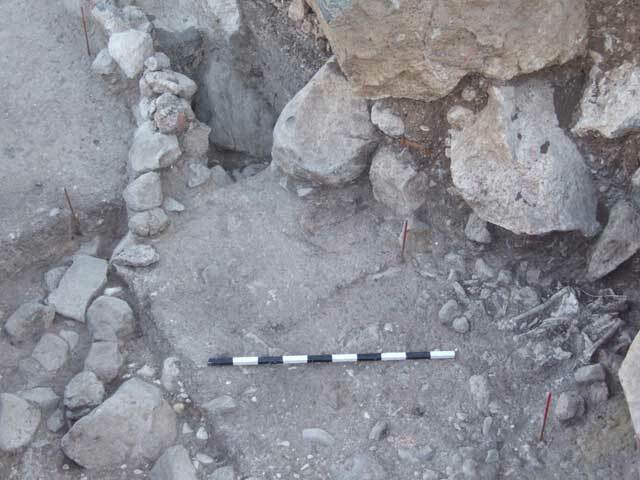 Human burial, looking southwest. 11. 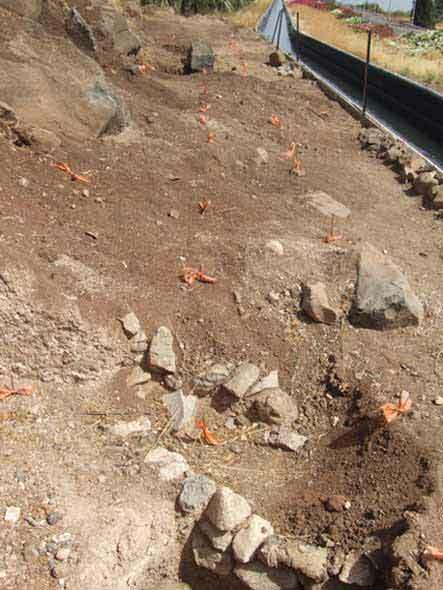 Human burial, close up view, looking southwest.